Posted July 21, 2015 by John Duffy MPSI, Claregalway Pharmacy in Features. Gout is a type of arthritis, typically caused by a build-up of uric acid in the blood. 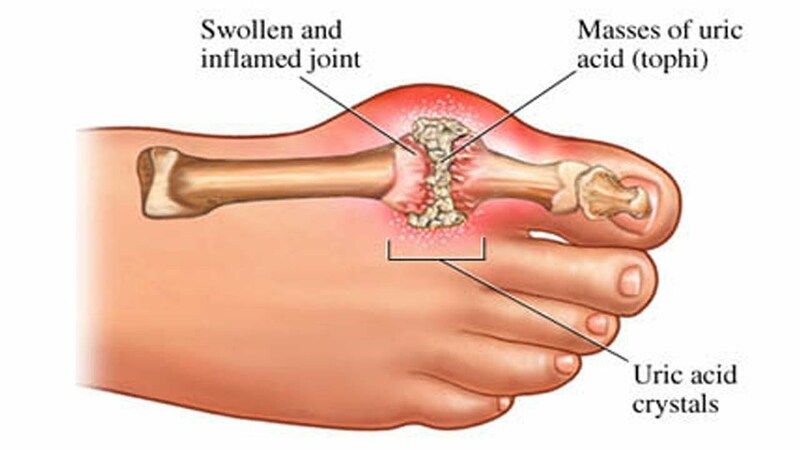 When levels of uric acid build up, it can cause crystals of uric acid to be formed, which deposit in joints and cause irritation, inflammation and swelling. This is known as a gout attack, which can be very painful. There are several reasons why the blood may contain high levels of uric acid. It may be a result of the kidney’s reduced ability to clear the uric acid. It may be an overproduction of compounds known as purines. It may be a combination of both. While medications are key factors in the management and treatment of gout, dietary factors can also play an important role. Following dietary advice may or may not accompany medications, but can help to stabilise levels of uric acid in the blood, which can reduce the risk of gout attacks. How can you prevent attacks of gout? 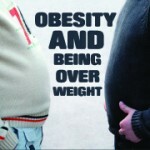 Obesity may be a primary consideration to reduce levels of uric acid in the blood. Insulin resistance is commonly seen in those who are obese, and may be involved in the development of gout. Insulin resistance has been shown to decrease the amount of uric acid that is cleared in the urine. A condition known as the ‘metabolic syndrome’ is a cluster of symptoms which includes insulin resistance, along with tummy (abdominal) obesity, high blood pressure and abnormal blood fats (lipids)—for example, high cholesterol. This condition is strongly associated with high uric acid levels, which can be improved with slow, gradual weight loss. Weight loss has been shown to improve insulin resistance, and therefore reduce uric acid levels in the blood. However, it is important to avoid strict diets such as low-carbohydrate and high-protein diets. These may increase consumption of purines, a compound that breaks down into uric acid. Additionally, rapid weight loss through strict dieting can result in breakdown of tissue. This can temporarily cause a rise in uric acid levels. A gradual, safe weight loss of 1–2lbs a week can help to achieve an optimal body weight. Drinking too much alcohol has been associated with gout for many years. However, it is uncertain how it may be related. Some types of alcohol, particularly beer, contain high levels of purines, which could be an indirect cause of gout. Alternatively, alcohol’s association with gout could be due to it’s contribution to obesity through excessive consumption. Alcohol contains 7 calories per gram and so drinking too much alcohol can lead to weight gain. There is more risk of gout attacks from drinking beer compared to spirits, and wine drinking in moderation has no associated risk. If you choose to drink alcohol, drinking in moderation is advisable. Two alcohol-free days a week are recommended. Aim to drink no more than 2–3 units per day for women, or 3–4 units per day for men. Higher-strength alcoholic beverages will contain more units. For example, a pint of a higher-strength beer (5.2% alcohol by volume) is 3 units, and a small 125 ml glass of wine (12% alcohol by volume) is 1.5 units. Ensuring a sufficient fluid intake helps to reduce the risk of crystals forming in joints. Keeping hydrated and avoiding dehydration can lessen this risk and help to prevent gout attacks. Dehydration occurs when there is a lack of fluid in the body. Aim to drink at least 2 litres per day. However, you may need as much as 3–3.5 litres per day depending on your weight, whether it is hot, or whether you exercise. Purines are natural compounds found in many foods. When purines are metabolised, they are broken down and their end product is uric acid. Therefore, reducing purine-rich foods, particularly if they are regularly consumed, may help to prevent attacks of gout. Reduce meat (particularly red meat such as beef, pork and lamb), fish and meat from poultry, as these are primary sources of purines. Aim to have no more than one serving of meat/fish/poultry per day, replacing with other sources of protein such as lentils, pulses, eggs or low-fat dairy products. It can be helpful to have 1–2 meat-free days each week. Overindulging in these foods can lead to weight gain and obesity. Additionally, sugary foods, drinks and snacks often contain fructose or what might be labelled as high-fructose corn syrup/glucose-fructose syrup. A high intake of fructose can increase uric acid levels in the blood and may increase insulin resistance. These are both risk factors for developing gout, so aim to limit these foods. As well as biscuits, cakes, sweets, fruit juices and sugary drinks, high-fructose corn syrup can be found in unexpected foods. These include Bread, Yoghurts, Frozen pizzas, Cereals and cereal bars, Jarred sauces, and some condiments such as jams, ketchup, mayonnaise or salad dressings. Check labels to compare products and choose fresh ingredients rather than processed foods when possible. Although fruit contains fructose it should not be limited. This is because fruit is not a concentrated form of fructose. When eaten whole it contains fibre, and protective vitamins and minerals such as potassium, vitamin C and other antioxidants, which are otherwise lost in processing. Which foods are the best to eat? The recommendation is five portions per day, but try to include as many as possible. Bulking out meals, such as bolognese, casseroles and stews with vegetables can help to reduce the meat content. Fruit and vegetables contain vitamin C. Although evidence is unclear, high intakes of vitamin C (500 mg or more) may help to reduce uric acid levels in the blood. Cherries may be particularly useful to include in the diet, as they have also been found to reduce levels of uric acid. These may include rice, potatoes, pasta, bread, couscous, quinoa, barley or oats, and should be included at each meal time. These foods contain only small amounts of purines, so these along with fruit and vegetables should make up the basis of your meals. Wholegrain varieties are better choices as they contain more fibre and nutrients. Using more vegetable protein and less meat can help to reduce the amount of purines in the diet—for example, lentils, beans and pulses. Having vitamin C with meals can help to improve the absorption of iron, so drink a small glass of orange juice, have a piece of fruit for dessert, or serve up meals with plenty of vegetables. Keep your portions of meat controlled by using your hands as a serving size guide. A serving is about the size and thickness of the palm of your hand. Including low-fat dairy products (such as skimmed milk, low-fat yoghurt, and low-fat cottage cheese) may help to prevent high levels of uric acid in the blood. These foods are a good source of protein and also have a low purine content so are useful additions to meals if you are trying to reduce meat/fish/poultry intake.